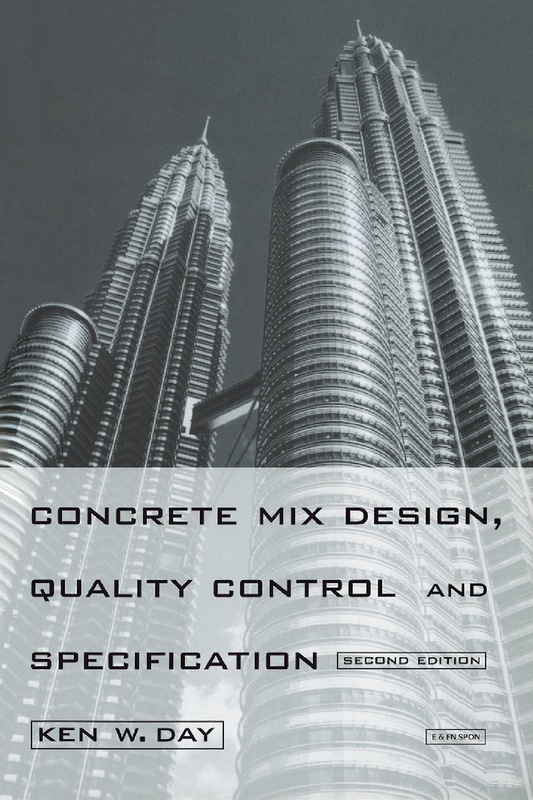 This book has the limited objective of teaching the reader how to design, control, and specify concrete. Although few people currently carry out these operations well, they are relatively easy to learn. However they are analogous to driving a car as opposed to becoming an expert mechanic. should reduce rather than increase cost. The selection of an appropriate quality or durability is important, but it has little to do with quality control/assurance. The objective of the latter is to enable attainment of the selected quality at minimum cost. importantly of delay, well in excess of $1 000 000. It gives some idea of the resistance to change that this situation, which few would now deny, was pointed out by the author in the 1950s (Day, 1958–9). If the above contention is accepted, it must give rise to a new set of rules and concepts. We have learned that there is no such thing as an absolute minimum strength. We now have to learn how to ensure that no structurally unacceptable concrete is supplied, i.e. to detect and rectify adverse quality shifts before any actually defective concrete is produced. Concrete cannot reasonably be rejected on the basis of the 28-day strength tests when there may, by then, be another five or six storeys of the structure built on top of it. Control action must be seen as an urgent and highly organized activity in which time is the essence and an hour is a long time. The author has spent more than 30 years designing, controlling and specifying concrete. In doing so he has found remarkably little assistance from standards and codes of practice. In effect it has been necessary to operate on two planes simultaneously. One of these is the official plane on which one must check for compliance with specifications, codes of practice, etc., and the other is the practical plane on which the satisfactory outcome of the work actually depends. It is the author’s hope that this book will assist in reconciling standard practice with realism. technology and little of such standard material is reproduced here. The implication may be noted that little of this material is actually used in the day to day design and control of con-crete. Whilst this is true to a considerable extent, it should be realized that proceeding in the absence of a more comprehensive knowledge of concrete technology can be like walking through a minefield with a map showing only natural features. There are hundreds of systems of concrete mix design, just as there are hundreds of cures for the common cold. In both cases the question is whether any of them really works. In the case of concrete mix design there is certainly substantial evidence to the contrary. Nearly all systems end by suggesting eye adjustment of a trial mix. Most commercial concrete results from the continued ad hoc modification of existing mixes without any application of formal mix design. good general purpose concrete of the desired strength then it will have very limited value. To be of real value a system must be able to guide the selection of available materials (of whatever quality) and proportion them so as to produce the most economical concrete which is suitable for the desired purpose. It is not particularly essential that the first mix produced has exactly the desired strength (although it may be essential that it exceeds this strength) since it is easy to subsequently adjust cement content. The first essential is that the most advantageous selection of aggregates be made and the second is that the concrete shall have the desired properties in the fresh state. Click on the word "LINK"